At Underwear For Men, we celebrate every season of the year. September 22 marks the first day of Fall and we are happy to welcome the new season (and hopefully some cooler weather). Even though you’ll find yourself transitioning your wardrobe to include scarfs, light sweater, and jackets, the only brand of mens underwear you need is Underwear For Men. Our brand is a great option for men to wear any season of the year. Just as you wear your UFMs in the summer, they provide you with support during traditional Fall activities. Try out a new hobby with our list of Fall recommendations. While the weather is optimal, enjoy new activities, sports, and experiences with your family and friends or on your own. No matter what stage of life you are in, taking the time to record your memories through photography is priceless. Fall is the perfect time to test your skills because the lighting, especially in the ‘golden hour’ of the day, is less harsh than it is in the summertime. Also, the natural colors of the outdoors in the Fall tend to be vivid, beautiful, and a perfect backdrop for photos. The cost of a camera (that is actually not a part of your cell phone) is lower than ever. A hobbyist purchase of a camera may cost a few hundred dollars. You can invest in more expensive equipment if it turns out you have an eye for photography. As you move to get the perfect angle, UFM mens underwear supports your manhood without forcing you to adjust. Available in briefs and boxer briefs. You may select boxer briefs with a 6-inch or 9-inch inseam. If you have more muscular legs or prefer a longer length we have the perfect men’s underwear for you. Our unique tapered leg design stays in place as you bend and move. UFMs won’t bunch or roll! Taking up a sport during the hottest time of year is difficult on your body in more ways than one. When you train the summer, you are training your body to work in a new way and you are forcing your body to fight the heat. If you are thinking of taking up running, fall is the perfect time to give running a shot because it is not as hard on your body. Simply pull on your favorite pair of sneakers to get moving. Also, UFM mens underwear gives you support and complete isolation to prevent chafing and rubbing. When you tie the drawstring to your preferred level, your manhood stays protected in a comfy pouch. UFM provides consistent support so you don’t need to adjust mid-run. Our mens underwear, designed for athletic use, makes the perfect solution for men of every fitness level. Once running becomes a hobby you enjoy, invest in new running shoes to protect your feet. A great way to motivate yourself to form a habit is to sign up for a race. This way, you’ll have an end goal in mind as you start your new routine. A number of our UFM loyals are avid cyclists. This is an excellent workout which also allows you to enjoy the most beautiful time of the year in the outdoors. You don’t need to immediately invest in a professional-grade bike to reap the benefits of the sport. If you aren’t comfortable riding on the road, try taking the scenic route through a city park. Thanks to our US patented and Intl patents pending adjustable pouch, men are able to tie the drawstrings to keep their manhood higher than usual. This keeps you from feeling squished or suffocated. Also, chafing doesn’t occur with UFMs because of the way the pouch separates your manhood from your leg. A great family activity that doesn’t break the bank is camping. If you don’t have any gear, you can choose an affordable cabin rental option at many state and most national parks. Fall is the perfect time to enjoy the outdoors without overheating or getting too chilled during the nighttime. All too often, people avoid camping because of the element of surprise involved in it. Instead of thinking of this as a negative, think of it as a positive. Camping is a chance to enjoy time with your family and solve problems if they arise. If worst comes to worst, you’ll have a good story to laugh at and retell around the dinner table. Whether you are an active camper or a relaxed one, Underwear For Men is great to wear. Because our mens underwear is made from moisture-wicking material, you stay cool and dry during the hottest parts of a Fall afternoon. Also, the material helps you stay odor-free and keep you from stinking up the tent. Once you wear your UFMs for an extended time frame, you’ll see just how much they support you from hiking to s’mores. When started in the Fall, gardening can produce results you’ll get to enjoy in a few short weeks. You might be surprised to learn just how relaxing and rewarding gardening gets. Staying attuned to the weather and sunlight allows you to appreciate all of the foods you purchase from the store. Some flowers and plants actually flourish in the sunlight during late September and early October. Growing small plants inside, like basil, produces an item perfect to toss into sauces. Gardening is the perfect hobby for a guy with a busy life. Take time for yourself and clear your mind while you complete tasks in your garden. You just might get hooked! 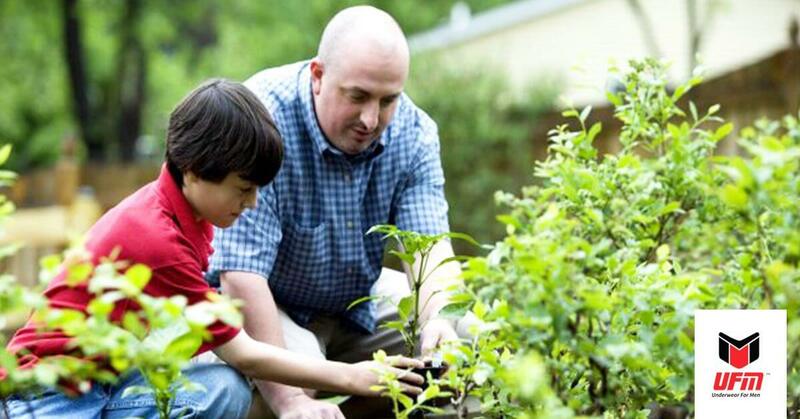 With gardening there is a bit of everything – you may be active in one minute and sitting in place in the next. No matter how much you are exerting yourself, our men’s underwear provides a gentle hammock for your manhood. No matter what your favorite Fall hobby happens to be, Underwear For Men is the right solution for every guy. As we mentioned, our mens underwear were originally manufactured for the athletic sector. After releasing UFMs to the market, we realized guys liked our product for everyday wear. Men suffering from medical conditions like hydrocele or discomfort in their testicles, find relief with UFMs. Since 2015, we have earned over 1500 five-star reviews, many from men who are able to enjoy their favorite activities once again because of relief from pain and discomfort. Our underwear is sold in sizes up to 5X. Enjoy this Fall and support your manhood with UFM men’s underwear.